Jose Berrios is one of very few Twins players who has actually taken a step forward so far this season. He should be the least of our concerns, but you can’t ignore what’s been a continuing downward trend of late. The Rangers hit three home runs off Berrios, as he gave up five runs and lasted just four innings in a loss at Texas Saturday night. This is the fifth consecutive start in which Berrios has failed to record an out in the sixth inning. Over that stretch, Jose has a 6.65 ERA, 1.75 WHIP, 1.77 K:BB ratio and has given up seven home runs in just 21 2/3 innings pitched. I’m not sure if this is fatigue, though I doubt that, and there doesn't seem to be any evidence, such as a dip in velocity. Maybe he’s tipping his pitches again? Either way, having Berrios on a backslide would be a pretty rotten way to end what’s been a rotten year for Twins baseball. Here’s hoping he can turn it around from here forward. That start didn’t put the Twins in much of a position to win tonight, but it did serve as an opportunity to get Andrew Vasquez’s major league debut out of the way. He gave up a hit and a run while recording two outs. The run was unearned because Vasquez committed two errors in the inning. The 6-foot-6 lefty was as advertised on the mound, throwing his slider on 11 of his 16 pitches while topping out at 90.1 mph, per Baseball Savant. Jake Cave had another great night, going 2-for-4 with a double and a mammoth homer. He even added a nice catch in center field. 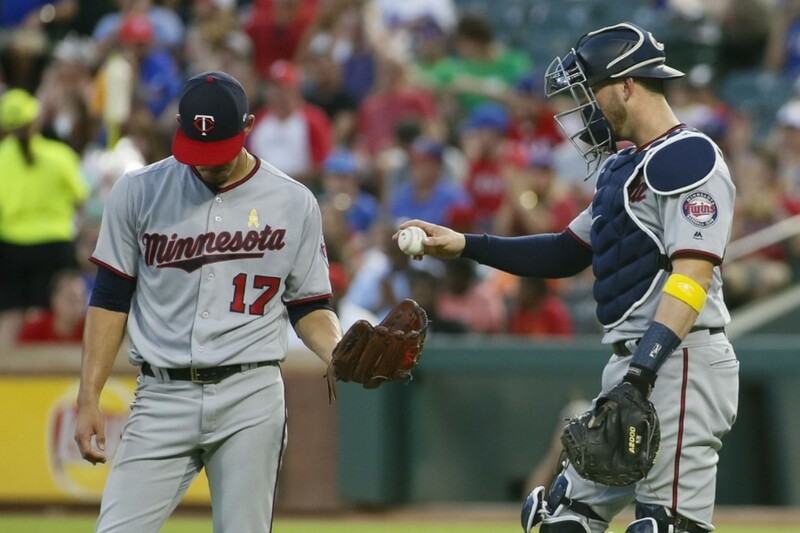 Joe Mauer also collected two hits and Logan Forsythe had a three-hit night. Berrios has had a dip in velocity. He used to be 94 - 96 and now he's 91 - 92. Poor strike ratio,a good number of walks and a ton of home runs. He's looking more like Gibson the past few years. Boy, it's kinda hard to say many positive things about this team. Berrios is regressing, Sano is looking bad again, and basically every Twins-system rookie is looking awful upon their arrival to the majors. Only the Yankee-system rookies are looking any good... it's like there's some sort of sickness in the water in the minor league pipeline. Vasquez topped out at 90? So is his slider his bread-and-butter and that's going to be his key to success? Jose had that start where he was sick and came out the first couple innings down around 90. Tonight he was consistently 93-94, which is pretty typical. He uses his height to helps with deception/effective velocity and gets tons of grounders. He only gave up two homers in 178 total IP down on the farm. I don't have a good enough eye to know specifically what he's doing mechanically to make that happen, but he's just one of those guys who back in the day they'd say throws a "heavy" ball. He started this year all the way down in Fort Myers, so it's pretty wild to see him make it this far in one season. Shining the spotlight on Berrios and his recent back slide got me thinking about other highlights of our Twins 2018 season. Eddie Rosario has cooled off as of late. Gibson, Forsythe, Cave, and Austin are (somewhat) bright lights that have not exactly set the world on fire. When does spring training 2019 begin? I read somewhere that his delivery for his pitches are similar so he has the added deception. I'm going to chalk it up to nerves again. First time seeing him pitch... I'm going to assume that his slider isn't meant to be consistently high in the zone like his was. I'm not sure we saw his best. Whatever his best may be. Maquina needs to be shut down.He just looks mentally weary.There are plenty of other arms to look at in September, and a full boat in the bullpen now. I understand that Vasquez had a long day in airports yesterday, arriving at the stadium shortly before game time.With his surprise call up and long day, I think the manager could have let him settle in and observe for a night before putting him out there.May have been better decision for all! Hey, at least he's taking some walks, right? 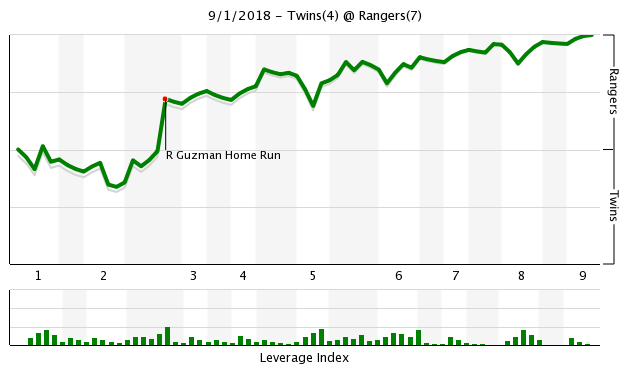 Pretty sad when the only thing to be happy about is your .206-hitting cleanup guy taking a coupla walks. Gonsalves and Stewart haven't just been disappointing...they've been just plain awful. No silver linings, either. I think it is a good thing for Jose to struggle down the stretch on a year like this one. It will only help him be better down the stretch next year when we really should be at least contending for a spot. All true, expect the minor league water seems just fine. It's the major league water that seems to be a problem. One comment that stood out - they only young guys that are shining are those that came up through the Yankee system.Our guys are their throw aways, they have two going for rookie of the year. So what does the Yankee system do that prepares their minor league players to advance that our Twins system does not.I read TD minor league reports get excited about seeing the guy in the majors and then the audition stinks, over and over and over. What is happening?Even when there is a good start - Romero, the wheels fall off, we demote and forget.How many coaches does this team need? One more thought, or group of thoughts:Is this what a September Call up for a losing team is supposed to look like?Belisle and Gimenez?We need a washed up 38 year old arm, and another second string catcher who cannot hit and was sent to the minors by the cubs?Astudillo is much more fun than any of these other hitless catchers.Gimenez is 35, and has 1.3 WAR over 10 years and he was batting 143 this year. Belisle is 38 and has a -0.6WAR for this year.What else do you need to know.So that makes two our call ups. Johnny Field has a collective 200 BA over 197 ABs.He is 26.In 6 seasons in the minors he has batted 270.What do we expect to get from him?Is he worth a spot over Wade or even old friend Vargas? Tyler Duffey had a wonderful debut (considering the Twins history that should have made us suspicious) and since then we have seen him struggle and fail at numerous roles.Is it time to try someone else?He has a career -0.5 WAR. Finally there is one I am excited by - Vasquez.Thank you.But while other teams are looking at their prospect list we are looking at the next to retire lists.What gives?Those of you who defend this FO have to tell me what great analytic strategy they are employing because once again I am at a loss. As bad as we have been and with no limits why aren't we building an addition to house all the minor league arms we can find and try them all? Yes, with the combination of travel and recent workload (I included his Triple-A appearances on the bullpen chart), it's certainly fair to have expected Vasquez not to be at the top of his game in his debut. I still don't mind Molly sneaking him in there for a short appearance just to get it out of the way. He's going to be a fun guy to watch, he's so different. As far as the September callup decisions, I think we know now that this front office is going to do everything it can to avoid having players accrue service time. These guys like Belisle, Gimenez and Field are around to hold back some of the other, more intriguing prospects. Who are the other, more intriguing prospects being held back? I read it as, two years into their regime, the 40 man roster is still so underwhelming that Belisle, Gimenez, and Field are still on it and, furthermore, among the first September call ups. Falvey and Levine should be embarrassed and publicly apologizing to Twins fans everywhere for the lack of progress they’ve made. Should have qualified that with "relatively speaking." Basically just point to a guy in either Triple A or Double A and they'd be more intriguing than the Belisle/Gimenez/Field types on this roster right now. How about Jake Reed, Brian Navarreto and LaMonte Wade instead? Buxton and Romero shut down for the rest of the season. Jose Berrios is one of very few Twins players who has actually taken a step forward so far this season. Slight improvement in K and BB rates and WHIP but the latter is based on lower than league average BABIP. He hit a wall in July.He was much more improved in April-July that last season and then things went downhill, esp with the breaking ball.If I were the Twins, I'd shut him down, figure out what's up, plus let someone else show what they can do. → Article: TEX 7, MIN 4: Is Jose OK?